Vitiligo is a common acquired skin condition in which epidermal melanocytes are lost, leading to complete loss of pigment. 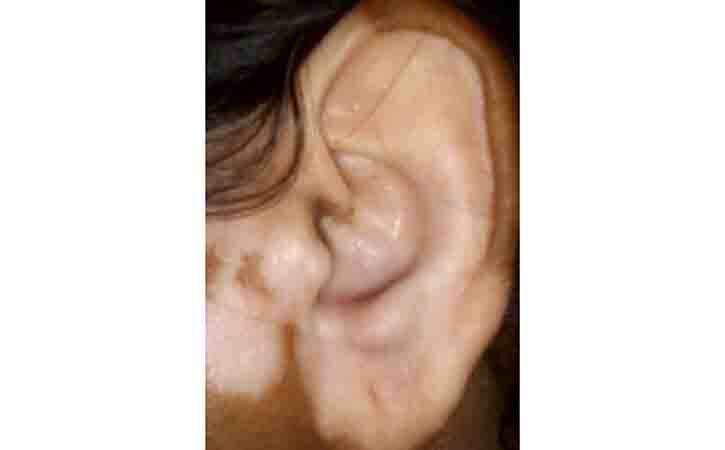 It is a disease that the loss of skin color in blotches. The extent and rate of color loss from vitiligo is unpredictable. It can affect the skin on any part of body. It may also affect hair and the mucous membranes (such as the tissue inside the mouth and nose) and the eye. Normally, the color of hair and skin is determined by melanin. Vitiligo occurs when the cells that produce melanin die or stop functioning. Vitiligo affects people of all skin types, but it may be more noticeable in people with darker skin. The condition is not life-threatening or contagious. It can be stressful or make feel bad. Most people who have vitiligo will develop the condition prior to age 40; about half develop it before age 20, peak onset between ages 10 & 30. Vitiligo may have a genetic component, as the condition tends to run in families (30%). Vitiligo is sometimes associated with other medical conditions, including thyroid dysfunction. Vitiligo is not painful and does not have significant health consequences; however, it can have emotional and psychological consequences. It is believed to be due to genetic susceptibility that is triggered by an environmental factor such that an autoimmune disease occurs. This results in the destruction of skin pigment cells. Risk factors include a family history of the condition or other autoimmune diseases, such as hyperthyroidism, alopecia areata, and pernicious anemia. It is not contagious. Vitiligo is classified into two main types: segmental and non-segmental. Most cases are non-segmental, meaning they affect both sides; and in these cases, the affected area of the skin typically expands with time. About 10% of cases are segmental, meaning they mostly involve one side of the body; and in these cases, the affected area of the skin typically does not expand with time. Diagnosis can be confirmed by tissue biopsy. 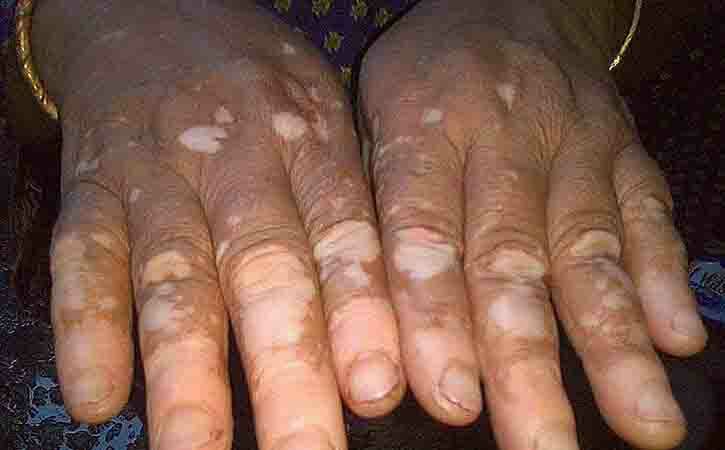 Many parts of body: With this most common type, called generalized vitiligo, the discolored patches often progress similarly on corresponding body parts (symmetrically). Only one side or part of body: This type, called segmental vitiligo, tends to occur at a younger age, progress for a year or two, and then stop. One or only a few areas of body: This type is called localized (focal) vitiligo. It’s difficult to predict how disease will progress. Sometimes the patches stop forming without treatment. In most cases, pigment loss spreads and eventually involves most of skin. Rarely, the skin gets its color back. It’s rare for pigment to return once the white patches have developed. The exact cause of vitiligo is unknown. Vitiligo may be an autoimmune disease. These diseases happen when immune system mistakenly attacks some part of the body. In vitiligo, the immune system may destroy the melanocytes in the skin. It is also possible that one or more genes may make a person more likely to get the disorder. The melanocytes destroy themselves. Vitiligo occurs when pigment-producing cells (melanocytes) die or stop producing melanin — the pigment that gives skin, hair and eyes color. A single event such as sunburn or emotional distress can cause vitiligo. But these events have not been proven to cause vitiligo. All treatments are not right for everyone. Some treatments can have side effects. Treatments can take a long time. Results vary and are unpredictable. Blister grafting: In this procedure, doctor creates blisters on pigmented skin, usually with suction. Then removes the tops of the blisters and transplants them to an area of discolored skin. Visit a doctor if areas of skin, hair or eyes lose coloring. Vitiligo has no cure. But treatment may help to stop or slow the discoloring process and return some color to skin.